So very happy that hiking weather is back! And so were my friends yesterday. The four of us set off early and had the whole mountain to ourselves. It was sunny, low humidity, perfect day for hiking. Everything is still green and lush, thanks to a hearty rainfall this month, the moss was still a little damp. We had a nice clear view of Roanoke. Here I am sitting on Buzzard’s Rock. This was a pleasant hike except for a couple of steep areas, and it was so peaceful – an advantage to being able to hike on a weekday when everyone is back in school. We even saw a couple of buzzards. If you look right in the middle of the picture, you should be able to spot one. 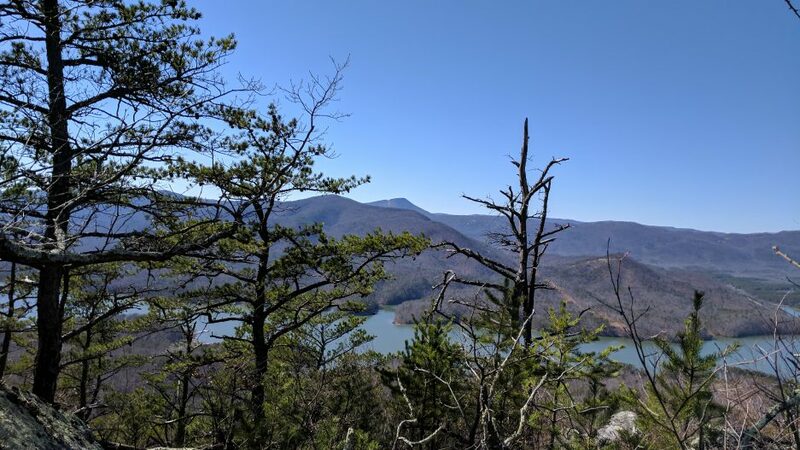 I think the highest mountain in this range is McAfee’s Knob, and to the right, half way down you can spot Carvins Cove. I’m starting to get the hang of this local geography. About 5.5 miles, just about 4 hours and lots of good conversation had us still smiling as we were pulling out of the parking area. How are you taking advantage of this fantastic weather?? A break in the heat, led to an early morning hike today. Continuing our trek on the New River Trail, we hiked from Fries (pronounced Freeze???) to Byllesby Dam. We have now completed 45 miles of the 57 mile trail. The trail beginning in Fries. The first part of the trail was so beautiful that we had to stop about every 5 minutes so JG could take pictures. Noticing all the rocks in the river, we decided it would NOT be ideal for kayaking. We got to Fries Junction – where the trail branches off into two trails. Somehow, I managed to walk right beside it and not even see it until JG said “well that’s a snake.” Fortunately, it was dead. I’ve been hiking for 5 years and this is the first time I’ve seen a snake. But of course, I was much more alert for the rest of the hike. Shortly after seeing the snake, we heard some unidentifiable noises coming from the woods. Most likely birds, but we were a little on edge so it seemed creepier than it probably was. The river became slower as we neared the dam and that made for ideal breeding ground for whatever likes to grow in marshy areas. We did spot this stoic heron. But then it got a little boring, and we were happy to see the car waiting for us at the dam. Going back to Fries to pick up the other car, we decided to eat at this little diner that we discovered on a previous trip. Maybe the bread was a little stale, and the tomato not totally fresh, but we were so hungry that we happily ate our BLT’s and watched the rain come. One thing I’ve learned, is that if you want to do something in Southwest Virginia, you have to do it early in the morning or you will have to battle Mother Nature. Driving home from Philly last week we decided to take back roads to see more of the countryside and because it is more chill. We spent the night in Frederick, MD and Thursday got up bright and early to start home. We were approaching Harper’s Ferry when my husband asked me if there was something significant about that town. So I googled it and found that YES there were several things. Most importantly, it is the location of the Appalachian Trail Conservancy. It is also the Eastern most point of West Virginia; it is where Maryland, Virginia and West Virginia meet; it is where the Potomac and Shenandoah rivers meet; AND it is historically known as the location of John Brown‘s raid on the Armory in the Civil War. So of course we had to stop. Since the AT goes right through town, we thought it would be fun to get on the trail for a little ways and see where it would take us. No, we didn’t have hiking clothes or shoes with us. But we were right there! Had to do it! Did I mention that it was approaching 90 degrees? Where it took us was to Jefferson’s Rock. Even though the views were impressive and the trail was not very crowded, I think we ended up hiking about a mile before we had to call it quits and get back in the cool car with a cold bottle of water. But not before enjoying the beautiful scenery rich in history. Summer is coming to an end and it won’t be long before hubby has to go back to work. After a few mini vacations in the mountains for hiking – we decided our last trip of the summer should be spent in a city. We found a great deal on an airbnb in the heart of Philadelphia! Rittenhouse Square proved to be an excellent spot from which to walk everywhere we wanted to go. We learned about how the city of Philadelphia came to be divided into 5 squares, and how William Penn and Benjamin Franklin are the most revered figures. Statues of both men can be found throughout the city. That’s William Penn on top of the City Hall. When we go to a city, we like to explore as much as possible on foot. When I say we hiked the city, we probably walked over 6 miles each day. We love the variety of food! Of course you can’t go to Philly and not have a cheese steak. There is some debate about who has the best ones – our friend Janet recommended Jim’s Steaks so that’s where we went. It did not disappoint. The architecture is a mix of old and new. This city has it all and we will have to go back several times to experience all it has to offer. That will not be a hardship. Now that I’ve been hiking for a few years, I realized my mistake in not buying “over the ankle” boots. My husband and daughter both warned me that I would need them to keep my balance and prevent ankle twists – but I just wanted a simple, light weight boot. Well, I finally had to admit they were right. Some of the rocks we have had to maneuver can be a little tricky. So last week I bought some super cool boots. . .
For a full boot, they are really light weight and I can’t wait to wear them in the woods. First it was the bears, then the heat, and now the rain has set in. So my lonely boots will have to wait patiently until all conditions are in place again. Hopefully, that won’t be too long. The mountains are calling.